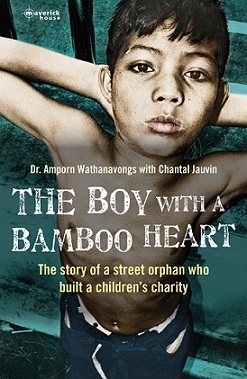 With the exotic landscape of Thailand as a backdrop, The Boy with A Bamboo Heart tells the story of one man’s quest for happiness. Orphaned at the age of five in a rural Thai village, Lek is thrust into a life-long struggle to find his place in the world. Alone and impoverished, he treads a precarious path, barely surviving in the markets of Surin until, at age fifteen, he finds himself brandishing a rifle as a boy soldier in the Cambodian jungle. Despair leads him to two suicide attempts. He is hell-bent on succeeding on his third try, but a stranger intervenes and offers him hope. Thus begins Lek’s journey to become Dr. Amporn Wathanavongs, foster father to more than 50,000 Thai children. Driven to become a reputable member of society, he returns to his boyhood village to study at the local temple. But when his vows as a monk collide with his desire to learn English and have a family, he must choose between settling for a safe and predictable life, or risk living as a vagrant on the streets of Bangkok while searching for a way to make his dream a reality. Through the generous support of a Jesuit missionary working in Thailand, he achieves his objectives. But having a family, a formal education, and a respectable job in social work are not enough. He perseveres and finds his true calling―helping others. While the very first few chapters of this book will have you on the edge of tears, what unravels is a gripping cycle of misery, hope and inspiration that has you willing for a triumphant ending. It is in all essence a true reflection of human resolve, hope and the simple will to survive.